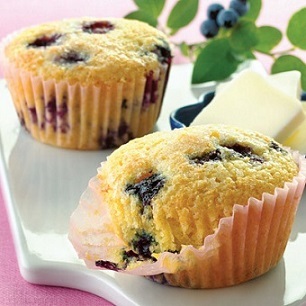 This Blueberry Cornbread Muffin Recipe will give you wonderful muffins to serve at breakfast or brunch. Use the recipe without the blueberries if you prefer. They will be fabulous. Bake 18-20 minutes or until a toothpick inserted in the center comes out "clean"
Always have your oven preheated to the correct temperature or your muffins will not bake correctly. Check doneness at the earliest suggested time as ovens may vary in temperature. When I measure flour I spoon it lightly into a dry measuring cup and level it with a spatula or the back of a knife. Also, if a recipe calls for sifting several dry ingredients you can simply put all the ingredients in a bowl and stir with a whisk. Thanks again for visiting. Please "stop in" frequently. I am adding to the website regularly. Enjoy your muffin recipe. 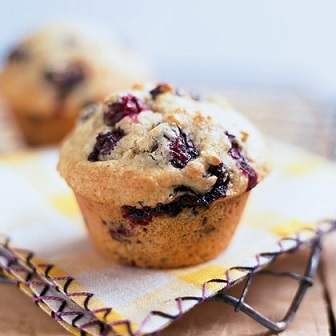 It's a real restaurant muffin recipe, and enjoy the company of those you share it with!